Lewis Wood, Elaine Barwick, Liam Godfrey and Sarah Sleigh fundraising for Reach. A north-east group, brought together by the UK’s leading volunteering charity, is raising funds for a community garden project. And they are boosting their own confidence with the help of the Reach organisation. 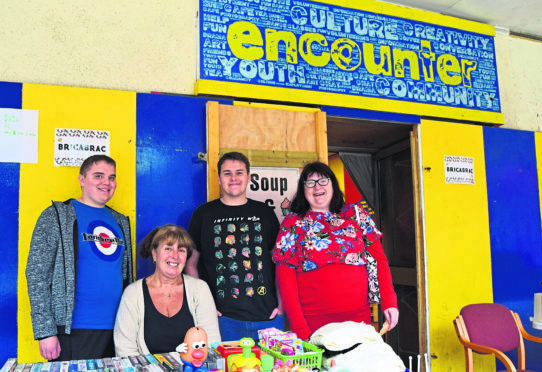 Members of Team Six held a soup and sweet event at the Encounter Youth Cafe on Drummer’s Corner, Peterhead, yesterday lunchtime. The team, aged between 18 and over 60, organised the fundraiser in two days to help fund their Landale Garden improvement project. People who are recovering from substance misuse or physical and mental health issues can join Reach to progress towards employment. Development coach, Rob Campbell said the noticeable transformation in each person was the most important thing. He added: “It’s so rewarding and they’ve done everything today, five weeks in when they wouldn’t have even spoken to each other before that, due to lack of confidence in themselves. “The 12-week programme aims at getting people back into work or further education as part of recovery. Former programme participants were attending the fundraiser and speaking to Team Six about their experiences. Some even brought in certificates and news of achievements since their graduation from Reach. A member of this year’s team, Dianne Penny, said: “It’s on Monday to Thursday, so I feel lost on Fridays. It was a lot of effort to get it together, but it was really fun. The team will be helping a group of volunteers renovate an area of Landale Gardens as part of their community project. Theresa Ritchie, a member of the Peterhead Civic Pride Group, said: “Volunteers have been trying to restore the area in Landale gardens since June. “Rob met us while looking for a community project for Team Six. “They’re going to help the volunteers in the small area to make it into a sensory garden and a pleasant place to sit. Local councillor Stephen Calder who popped in for his lunch said: “It was delicious.